Israel is in the news again for another disproportionate response. 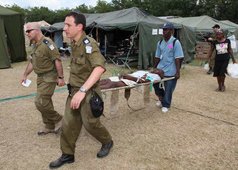 Out of all proportion to her proximity and wealth, Israel is currently providing crucial and effective medical support to the victims of the Haiti earthquake. CNN, Sky, and MSNBC are praising the way in which the Jewish State is able to save lives. Can we look for a more inspiring example of how Zionism has succeeded in changing the way that Jews function in the world? It is easy to talk of Jewish values, but only when those values are embodied in the ways that Jews behave collectively in the world do they find realization. May we know many less tragic opportunities to feel such pride in Israel.